Everyone is well aware of ethernet cables because you all use PCs, internet routers and switches unless you’ve been living under a rock. These cables are a key part of the home-computing experience and are used to connect devices within a local area network to ensure a smooth transition of data. 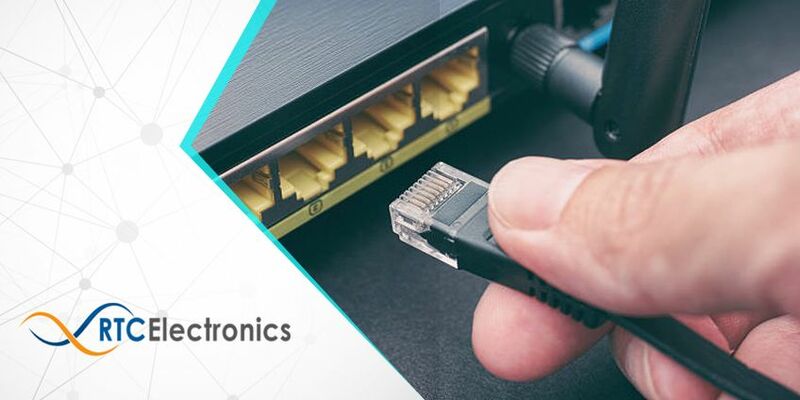 However, irrespective of using ethernet cables in their homes and offices, many people still have several questions regarding these cables such as which is the right ethernet cable to use, where to connect the cable and which one will be the best for a certain device? Fear not! You’ve come to the right place. 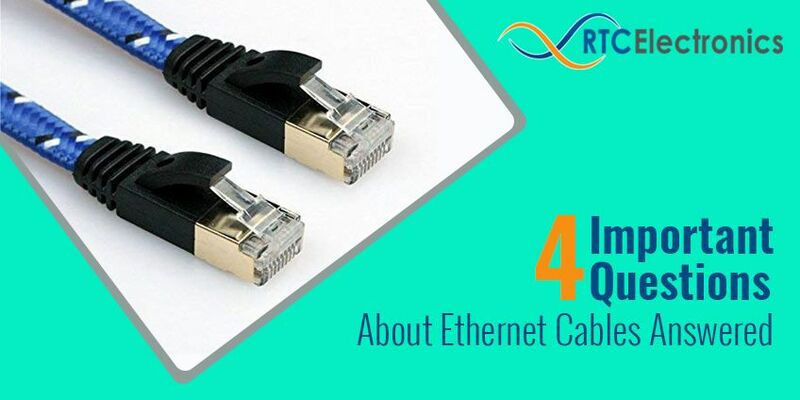 In this blog post, the team of RTC Electronics has answered four important questions about ethernet cable to help you out. 1) What Is the Best Ethernet Cable for Gaming? If you do some heavy gaming and need an ethernet cable that can speed up downloading of large game files, then go for Cat 5e or Cat 6 cables. Both are great options and work in the same way. Since Cat 6 is an improved version of Cat 5e ethernet cable, it can perform better. The difference between the two is that Cat 5e has a maximum bandwidth of 100 MHz and offers speed of up to 1 Gigabits per second whereas Cat 6 has a maximum bandwidth of 250 MHz and offers a speed of 10 Gigabits per second. 2) How to Connect an Ethernet Cable to a Router? 3) Why is My Ethernet Cable Not Working? How to Fix it? There can be several reasons why your ethernet cable is not working. For example, loose connection, faulty wire, outdated driver, broken port or network issue. You can find out the actual cause of trouble and fix it by going through certain methods. First of, try the old trick of turning off your computer or laptop, unplugging the wire, plugging in the cable after 30 seconds and turning the system on. If this method resolves the issue, then you can breathe a sigh of relief. Secondly, check if the ethernet is enabled in your system or not. Go to ‘Device Manager’, right click on ‘Network Device’, if you see ‘Disable’ option, select ‘Enable’ and restart the system. Once it is enabled, check the connection. If the above two methods are not helping, then update drivers as the old driver can have a compatibility issue. 4) Which Is the Fastest Ethernet Cable? Among the different types of ethernet cables available, Cat 6 cables are the latest and the fastest type in the market. These cables offer the performance of up to 600 MHz, allows up to 10 GB per second speed and has a shielding of its twisted pairs that improves noise resistance. They are compatible with older devices as well. They can fall too heavy on your pocket, but choosing them really pays off because of their impressive features. We hope that this blog post was able to answer your questions about ethernet cables. Anything we missed? Do let us know by visiting our store or giving us a call. RTC Electronics will surely help you make an informed buying decision to get premium electronic accessories. Ethernet cables are standard cables commonly used to connect devices to networks like a modem to a LAN or a router. You can see them connected to the back of your computer equipment. They comprise of a pair of RJ45 connectors and a set of four twisted pair cables. Even though all Ethernet cables look the same, they differ because of the change in the construction of cabling. The type of cabling used, the way they are bundled and terminated with a connector is what makes one Ethernet cable different from other. Broadly speaking, there are 6 varieties of these cables. So, if you’re planning to buy Ethernet cables, it’s necessary to understand the different types and their features. 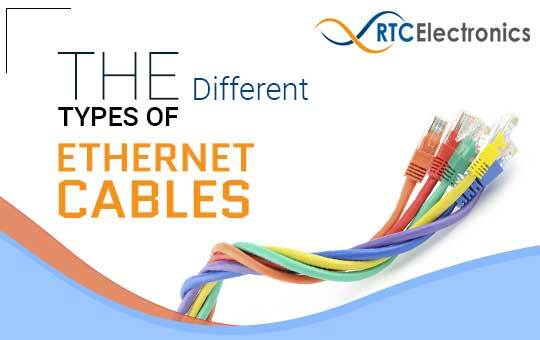 Here’s a guide to help you that describes the most common categories of Ethernet cables. Category 3 or Cat-3 cables are the older version of Ethernet cables with a maximum transmission speed of 10 Mbps. Also known as Station Wire, they are unshielded twisted pair (UTP) cables with a maximum possible bandwidth of 16 MHz. They were mostly used for Voice-Over-Internet Protocol (VOIP) and other voice solutions. But, due to problems with cross-talk and interference, they are no longer used. Cat-5 cables were introduced after Cat-3. They are also a UTP cable but with a faster transfer speed of 10/ 100 Mbps and a maximum bandwidth of 100 MHz. These cables were the first Fast Ethernet-capable cables to be introduced. The cables of Cat-5 were wrapped with fewer twists per foot, thus reducing the amount of interference. Apart from Ethernet data, these cables were used for video and telephone signals. The Cat-5e cables are the upgraded version of Category 5 cables. This optimized version was introduced to reduce the unwanted transmission of signals between channels. With a transmission speed of 1000 Mbps and a maximum bandwidth of 100 MHz, these cables completely replaced its predecessor. Cat-5e cables contain four twisted pairs of cables and utilise all of them for Fast Ethernet, unlike Cat-5 cables which utilised only two. These features make these cables the most widely used Ethernet cable in the market. They are mostly used in homes and small business network installations. The Cat-6 Ethernet cables are very similar to Category 5e. With a bandwidth of 250 MHz, these cables were designed to give a maximum transmission speed of 1000 Mbps. These cables were introduced with several improvements such as thinner wires and better insulation. They are available in both Shielded Twisted Pair (STP) and UTP forms. They are tightly bundled and outfitted with foil or braided shielding to prevent crosstalk and noise interference. They mostly work best for building and commercial applications. The Cat-6a cables or ‘Augmented’ Category 6 cables allow transmission speed of 10000 Mbps over longer cable lengths and supports 500 MHz of bandwidth. They are always shielded that enables them to eliminate crosstalk and interference. The sheathing of these cables makes them thicker and less flexible compared to other Ethernet cables. The Cat-7 cables, also known as Class F cables, are the newest and most widely-available variety of Ethernet cables. They support a speed of up to 10000 Mbps and bandwidths up to 600 MHz. These fully shielded cables have layers of insulation within them with a twisted pair of wires. They are the best choice for connecting routers or modem directly to a device as they are cable of reaching 100 Gbps at a range of 15 meters. The next time you plan to purchase an Ethernet cable for your home, consider checking the transmission speed and supported bandwidth and choose the one that best suits your device. To learn more about Ethernet cables, visit a reliable electronic store near you. Coaxial cables are becoming a well-known term these days. More and more modern homes are adopting them because of their audio-visual utility. These cables have a four-layered copper base and are used to transmit radio frequency signals. Television & radio networks, distance telephone networks and Ethernet generally use long distance coaxial cables due to their high bandwidth and exceptional transmission capacity. 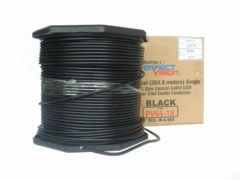 Mainly used for reaching a widespread audience, coaxial cables are compatible with most computerized gadgets. • Cannot expect high-resistance from them. Coaxial cables are known for their excellent performance and versatility. It’s the most common means of data transmission over distances. However, they have their limitations. It is up to you to decide if your needs require the use a coaxial cable.